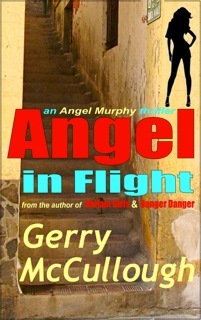 “Angel in Flight” by Gerry McCullough is an excellent and fast paced thriller set in beautiful Greece. Angela Murphy, or Angel, is stunned when she spots her ex-husband Mickey in Athens of all places. She has more reasons than one to avoid him and so her holiday instantly becomes a tense affair. The sense of tense urgency and danger is immediate in the writing, establishing a great dramatic curve; the setting is atmospheric and we know that there is more drama and complication to come, especially once she meets an old acquaintance, Frank, and then Josh Smith. Angel is a great and surprisingly tough character who can hold her own against criminals, drunks and men. I liked her as the deep and thoughtful heroine that shows vulnerability and strength and one whose aim is not to find a man and live happily ever after. The action is based around a vaccine for Malaria but the story is more evolved than that. It is a very entertaining and enjoyable thriller that showcases a very gifted writer.